Toyo Matic Aerospace Ltda is located at: Estrada Municipal Vereador Álvaro Alessandri, nº 1017, Campo Novo, Bragança Paulista / SP, Brazil. The company was founded in 1987 and at this time had as main activity the renovation of machinery and equipment. Then, in order to meet its own needs and in the face of the lack of spare parts in the market for this activity, the company sought to perfect its techniques and resources and specialize in the machining segment. 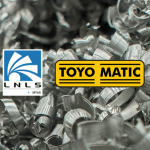 Over the years, Toyo Matic has expanded its market, producing parts of high level of complexity and precision in the most diverse areas. The figure below relates the evolution of performance over the years in the main segments.